I was under the impression that Stack Exchange sites were forums, or forum-like objects. If they are not forums: Why aren't they? What defines a forum? Stack Overflow is not a discussion forum. Most forums are largely discussion-based and tend to follow less strict rules about what posts can be like. On Stack Overflow (and Stack Exchange in general), we require every new thread to be started with a question and every response to that question to be an attempt at answering it. For example, on a typical forum you might ask how to run a game in windowed mode. You will get several responses, some of which will be nothing but "oh, I love that game!" or "I haven't played that in a while, wow." You'll be lucky if you get a relevant response. By contrast, on Stack Exchange you'd get practical responses that are 100% relevant to your question. Stack Exchange creates communities that draw in experts in particular fields who are interested in communicating and learning at a professional level. This results in writing quality being an important aspect of the site. Stack Overflow (Stack Exchange, in the more general sense) is not a forum. In a dictionary sense, a "forum" is a place where ideas and views can be exchanged. But in a larger Internet context, a "forum" is traditionally regarded as a place where issues (questions) are discussed in a threaded manner. A topic of discussion is posed where people can respond, and responses are allowed to evoke further sub-conversations… which generate still further discussion — ad infinitum until all possible facets have been discussed, or the participants lose interest. In contrast, Stack Exchange encourages specific questions that have specific, canonical answers. A question is asked and respondents weigh in with a carefully thought-out response which is then vetted through voting and wiki-editing (improving on the answer). The key difference is that each answer posted has to stand on its own. Stack Exchange neither supports nor encourages a "forum-style" of open, free-for-all discussion (many-to-many conversations). This is by design. The advantage is that users can vote on the best answers which then float to the top. You don't have to worry about breaking the conversation thread, and answers are not buried deep down in the larger context of an entire, vast "conversation." We prefer this Q&A format over the "forum"-style conversations typically found on the Internet. People who say "this is not a forum" are simply urging users to avoid the patterns that cause traditional forums to fail. Stack Exchange is built on the premise that forums don't scale. All those open conversations mean that those forums only tend to get noisier and noisier. What inevitably happens is that long-time users get tired of the new users asking the same old questions. New users can't find useful information and feel ostracized. And most find that, the more they talk, the less value they get from the experience. In short, you stop learning. Remember this image from the FAQ? We are different than just a forum, we are a Q&A site that is on the border of all these different types of sites. We have a forum aspect in terms of limited discussion in comments and on our meta. 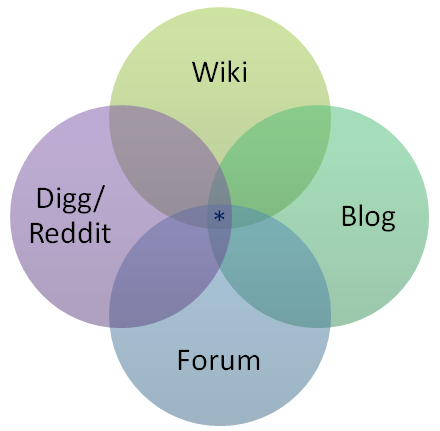 We have two blog networks, one for fourth place blogs and one for developing beta blogs. Our voting and view counts give the site a Digg / Reddit aspect, but only that. A lot of users are helping to build a canonical set of answers, which is the Wiki aspect of our network. But in general, it's not about "discussion, blogging, votes, views or answering"; it is all about learning. Yes, for some definitions of forum. One could speak very generally and claim that Stack Exchange sites embody a meeting place for the discussion of questions of public interest. More and more it's becoming a marketplace and place of assembly for the people - we have careers and chatting. Stack Overflow in particular aims to attract all the average and above average programmers in the world. Strictly speaking, Stack Exchange is a Forum. Colloquially speaking, however, one must take into account the connotation of the word Forum in connection with the internet. For many years "forum" software has been developed to encourage non-directed discussion. The format of most forum software encourages personal conversational style, and if there is a desire for direction it must be enforced by moderators, rather than simply by the design of the software. Stack Exchange is very directed toward problem solving, and strongly discourages conversational style discussion. There is a question, and there are multiple answers, and there are comments. While comments are a bit more loose, the question and answers must fit very specific criteria to be accepted as part of the discussion. Further, Jeff and Joel have spent some considerable time in branding their product as distinctly different than existing internet forums. So whether it's a forum largely depends on one's personal definition of a "forum", however, technically speaking, the Stack Exchange platform is most certainly a forum, and as they expand it and add new features it only becomes more a forum than anything else. The questions and answers are really not a forum in any way, I think that's pretty easy to see. Each and every comment should be made with the end-goal of wrapping up a discussion, not starting or encouraging one. Not the answer you're looking for? Browse other questions tagged discussion scope forums . Has anyone ever mentioned their Stack Overflow profile on their CV? Is it appropriate to directly ask users to alter their behavior? Great Q&A! Can I have some? Is it ok to upvote or downvote all the posts of one person regardless of their content?